Saqib Saleem Qureshi (pronounced [saːqib səˈliːm qureːʃiː]; born 8 April 1988) is an Indian film actor and model who works in the Hindi film industry. He worked as a model before beginning his film career. After moving to Mumbai, Saleem appeared in several advertisements. While doing television commercials, he grew interest in films and started auditioning for film roles, eventually signing a two-film deal with the Y-Films, a subsidiary of the Yash Raj Films (YRF), as an actor. Saleem made his acting debut with a leading role in the 2011 romantic comedy Mujhse Fraaandship Karoge, a box-office success. He was appreciated for his performance and earned a nomination at the Filmfare Award in the Best Male Debut category. The following year, he completed his two-film contract with the Y-Films by appearing in Mere Dad Ki Maruti, a romantic comedy that proved to be a critical and commercial success. Subsequently, he played a supporting role in the experimental anthology Bombay Talkies (2013). While not a box-office success, the film garnered him positive response from critics. He received further praise for played the lead in the critically acclaimed passionate drama Hawaa Hawaai (2014). In addition to acting in films, Saleem is an active Charitable worker, has a number of endorsement deals, and a member of the "Mumbai Heroes" at the Celebrity Cricket League, a non-professional men's cricket league in India. Saqib Saleem was born in Delhi, India. His father, Saleem Qureshi, is a restaurateur, and runs a chain of 10 restaurants called Saleem's, all around Delhi. His mother, Ameena Qureshi, is a house wife. He has one sister Huma Qureshi and two brothers, Naeem Qureshi and Haseen Qureshi. During college, Saqib briefly assisted in the running of the restaurants, but did not like it. By that time Saqib had already started modelling, and he moved to Mumbai despite his father's preference that he stay in Delhi and earn a Master of Business Administration degree. Saqib started his career with Cricket playing for Delhi and Jammu & Kashmir.A cricketer all his life Saqib never thought of becoming an actor. After reaching Mumbai, Saleem started out by doing a few modelling assignments, eventually moving into television advertisements for brands like Pepsi, Lays (with actor Ranbir Kapoor), Tata Docomo, Bar One, KFC, Airtel, Sprite and others. While shooting for the ads, Saqib's interest grew in acting and he started auditioning for film roles in Bollywood films. His close friend, fashion designer Varun Bahl, helped him get a chance to audition for Yash Raj Films. "It was gruelling," he recalls. After eight months of auditioning, he bagged the leading role in the Y-Films romantic comedy Mujhse Fraaandship Karoge. "Today's youth spend a lot of time on Facebook. You are constantly connected to each other through so many things like BBM. I feel the ways our lives have been till now, our college experiences, the fun we had back then. We drew inspiration from all these things." —Saleem talking about his main inspiration behind the character of Vishal in Mujhse Fraaandship Karoge'. Saleem with Tara D'Souza, Saba Azad and Nishat Dahaiya at the promotional event for Mujhse Fraaandship Karoge, 2011. In 2010, one of his friends informed him that Bollywood film production house Yash Raj Films (YRF) was auditioning for new faces. Saleem was interested and he gave his audition. However, it was 8–9 months before he got confirmation from the production house that he had been selected. The film for which he was selected for was Mujhse Fraaandship Karoge, a romantic comedy set against the backdrop of social networking site Facebook; it was directed by debutante Nupur Asthana. Mujhse Fraaandship Karoge is a love story which develops on Facebook where the protagonists change identities to make their partners fall in love with them. Starring newcomers Nishant Dahiya and Saba Azad, along with Saleem and Tara D’Souza, the film was released under Y-Films, a subsidiary of YRF. The role that Saleem had to play was that of a college prankster called Vishal Bhatt, who with his friend Hacky, go on playing pranks on their friends. Saleem explained that he "liked the script and I did it. I feel the youth will relate and connect with it. I think the movie will put me in a different light and open lot of doors for me." The youngsters had to undergo a month of workshops under Aditya Chopra, where they rehearsed each other's lines from the script. Saleem with Saba Azad at the premier of Mujhse Fraaandship Karoge, 2011. Filming began in April 2011, with production continuing till August 2011. Mujhse Fraaandship Karoge released all over India on 14 October 2011, and became a critical success. Anupama Chopra from NDTV complimented the film for being a hackneyed love story, but excitingly brewed with fresh faces. She also commended Saleem's and Azad's acting, calling them faces to look out for in the coming years. Filmfare's Karishma Loynmoon applauded the chemistry and comic timing between Saleem and Azad, and overall dedicating the success of the film to them. Her view was shared by Nikhat Kazmi from The Times of India, who added that the film "brimmed over" with youth iconography. Mujhse Fraaandship Karoge scored high over the other releases like Aazaan and My Friend Pinto. The film collected about ₹5 million (US$70,000) on the first day of its release, adding it to first weekend collection of about ₹22.5 million (US$310,000) in the opening weekend. It was declared an average grosser by Box Office India. By the end of 2011, Saleem was touted as the best newcomer of the year, with Robin Bansal from Hindustan Times commenting that "Saleem’s American Pie college boy style is expected to take him places, if he manages to get plum film projects in the future." Critic Joginder Tuteja commented that although Saleem did not have the personality of a quintessential Bollywood hero, he made his presence felt in Mujhse Fraaandship Karoge. "It will be a pity if he isn’t seen in the years to come", concluded Tuteja. At the 57th Filmfare Awards, Saleem was nominated in the Best Male Debut category. Saleem at the audio release of Mere Dad Ki Maruti, 2013. The following year, Saleem appeared in Y-Films's Mere Dad Ki Maruti directed by Ashima Chibber. The film revolves around a Punjabi wedding, where a boy (played by Saleem) steals his father's car to impress a girl and portrays how his plans go astray. The year 2013 saw the release of the experimental anthology film Bombay Talkies consisting of four short films. Saleem was part of the Karan Johar's segment titled "Ajeeb Dastaan Hai Yeh", opposite Rani Mukerji and Randeep Hooda. He played the role of Avinash, a young homosexual man, who is infatuated by his co-worker's husband. Saleem followed this success with a lead role of Aniket Bhargava, a skating coach in the 2014 passionate drama Hawaa Hawaai. Directed by Amol Gupte, the film was proved to be a critical and commercial success, and Saleem received positive reviews for his performance; film critic Subhash K. Jha concluded, "Saqib is very cinematic, we witness the full force of Saqib's virtuosity." Noyon Jyoti Parasara wrote that "Saqib justifies his place". Saleem's next role was of a cricketer in the action thriller Dishoom (2016), also starring Varun Dhawan, John Abraham and Jacqueline Fernandez. Although Saleem said that the story of the film revolves around his character, critics noted that his "brief role" was overshadowed by the film's leading cast. The films was a commercial success. Despite mixed reviews, the film proved to be moderately successful at the box office. The Relativity Media and Balaji Telefilms joint-production Dobaara: See Your Evil featured Saleem and her sister (Huma Qureshi) as the children who are convicted with their parents murder. Directed by Prawaal Raman, the film was the official remake of the 2014 Hollywood film Oculus, and received mixed reviews from critics. The romantic comedy Dil Juunglee saw Saleem play a typical Delhi boy who aspires to be an actor but falls in love with her best friend (played by Taapsee Pannu. Although the film was poorly received and failed at the Box Office India, Saleem and Pannu's on-screen chemistry was praised by several critics. Sweta Kausal of Hindustan Times said that it was only "Taapsee Pannu’s charm and Saqib Saleem’s earthiness that keep the movie from getting unbearable." Renuka Vyavahare of The Times of India commented "Barring the earnest performances of the lead actors and the supporting cast, there’s absolutely nothing wild or memorable about the film." After this he has worked in action-thriller Race 3 directed by choreographer changed director Remo D' Souza also starring Salman Khan, Jacqueline Fernandez, Daisy Shah, Anil Kapoor. The film is commercial success. 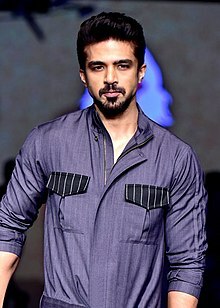 In addition to acting in films and modeling, Saleem is a member of the "Mumbai Heroes" along with several actors at the Celebrity Cricket League (CCL), a non-professional men's cricket league in India consisting of film actors from eight regional film industries of the Indian cinema. The league was commenced in 2011, and since its establishment, it has been widely reported in the Indian media. Avinash Segment: "Ajeeb Dastaan Hai Yeh"
^ Aniruddha Guha (13 September 2012). "Siblings in Bollywood". Tribune.com. Retrieved 13 September 2012. ^ "Icelus I (gk.)". doi:10.1163/2214-8647_bnp_e522960. ^ Karishma (7 August 2012). "Saqib in Bollywood". Koimoi. Retrieved 25 March 2011. ^ Karishma (7 August 2012). "Saqib Saleem; who's that boy". Times of India. Retrieved 25 March 2011. ^ Karishma (25 March 2011). "Saqib and Huma buy an apartment together in Mumbai". Koimoi. Retrieved 25 March 2011. ^ Aniruddha Guha (13 September 2012). "Saqib Saleem on his contemporaries". Tribune.com. Retrieved 13 September 2012. ^ Aniruddha Guha (13 September 2012). "Saqib Saleem; who's that boy". Indian Express. Retrieved 13 September 2012. ^ "Saqib Saleem; hit the screen". 7 August 2012. Retrieved 25 March 2013. ^ "Qureshi family thrilled". 7 August 2012. Retrieved 25 March 2013. ^ "I hail from conservative family". 29 October 2014. Retrieved 29 October 2014. ^ "Saqib Saleem on sister Huma's link up with Shahid Kapoor - The Times of India". The Times Of India. ^ "From Saleem's". India Today. Retrieved 10 February 2013. ^ "Brother-sister bonhomie in Bollywood - The Times of India". The Times Of India. ^ Loynmoon, Karishma (17 June 2012). "Who's That Girl". Filmfare. Times Internet Limited. Retrieved 14 August 2012. ^ a b c d e f g h Sudi, Arun (5 October 2011). "My father wanted me to do MBA, says debutant Saqib". The Indian Express. Indian Express Group. Retrieved 9 January 2012. ^ "All good things start with cricket!". Times Blogs. Retrieved 10 February 2013. ^ "Saqib Saleem; whoes that boy". The Telegraph. Calcutta, India. 5 October 2011. Retrieved 9 January 2012. ^ a b c Nayar, Anjuri (14 October 2011). "Love, life and Fraaandship on Facebook". The Times of India. The Times Group. Retrieved 9 January 2012. ^ "Yash Raj Films' new banner to launch seven actors in 3 movies". Business of Cinema. 1 April 2011. Archived from the original on 20 October 2011. Retrieved 9 January 2012. ^ a b Chopra, Anupama (14 October 2011). "Review: Mujhse Fraaandship Karoge". NDTV. Retrieved 9 January 2012. ^ Loynmoon, Karishma (15 October 2011). "3 Stars: Mujhse Fraaandship Karoge". Filmfare. The Times Group. Retrieved 9 January 2012. ^ Kazmi, Nikhat (14 October 2011). "Mujhse Fraaandship Karoge". The Times of India. The Times Group. Retrieved 9 January 2012. ^ "Ra.One Countdown Begins, Mujhse Fraaandship Karoge Picks Up At Box-Office". Koimoi.com Komal Nahta Publications. 21 October 2011. Retrieved 15 January 2012. ^ "Mujhse Fraaandship Karoge Has Best Weekend". Box Office India. 11 October 2011. Archived from the original on 18 October 2011. Retrieved 9 January 2012. ^ Bansal, Robin (28 December 2011). "Newcomers in B-town for 2011". Hindustan Times. HT Media Ltd. Retrieved 9 January 2012. ^ "'Mere Dad Ki Maruti' goes on floors". The Times of India. 16 May 2012. Retrieved 14 May 2012. ^ "'Hawaa Hawaai review". India Today. 11 May 2014. Retrieved 14 May 2014. ^ "'Hawaa Hawaai review; Saqib Saleem Justifies his place". Rediff.com. 5 October 2014. Retrieved 9 January 2014. ^ Kha, Subhash K (2013-05-15). "Saqib Saleem to play skating coach in Amole Gupte's Hawaa Hawaai". Bollywood Hungama. Retrieved 28 July 2013. ^ "That's a wrap! Dishoom Abu Dhabi shooting comes to an end – The National". Retrieved 20 March 2017. ^ Hungama, Bollywood (30 July 2016). "Box Office: Worldwide Collections and Day wise breakup of Dishoom – Bollywood Hungama". Retrieved 20 March 2017. ^ "Dobaara - See Your Evil stars Huma Qureshi, Saqib Saleem in story of a haunted mirror". Firstpost.com. 2017-05-04. Retrieved 2017-06-15. ^ "Huma Qureshi turns to horror cinema". ^ "Dobaara movie review: You won't want to mess with Huma Qureshi, Saaqib Salim's mirror". Hindustan Times. 2017-06-02. ^ "Dobaara: See Your Evil Movie Review - Huma Qureshi's Film Isn't A Spine-Chiller". NDTV. ^ "Dil Juunglee movie review: Taapsee Pannu, Saqib Saleem save this cliched love story". Hindustan Times. 2018-03-09. ^ "Dil Juunglee Movie Review". The Times of India.